Sete, France on a weekend in the summer is more than a bar scene. It’s a multi-cultural extravaganza. In fact, there are so many activities going on in Sete it’s hard to decide what to do first. Regardless of what you choose, you can’t go wrong. It’s going to be different from anything this Southern girl has ever seen. Just a walk around town is an experience. A walk to the “central park” presented a chance to see a ride for kids I wish was in every town. Children LOVE getting the exercise racing each other on their make-believe ponies. The city is a major seaport for France so Sete takes advantage of every aspect of being an international coastal town, from seafood markets to private beaches. Oysters are so abundant in Sete, people of the town enjoy the salty, tender mollusks all times of day. These pictures were the “small” version. On weekend mornings, people of Sete are gathered in the city market (Halles) enjoying oysters and beer. In fact, shell fish of all types are ready for eating on the spot, or to bag up to take away. If you’ve never tried sea snails, you must. But then, you’d better like chewy things, because they will remind you of a tasty pencil eraser. Nighttime in Sete is a thrill to the senses. The views, the music, the whole atmosphere is as exciting as to see as it is to feel and to enjoy. Daytime is Sete is beach time and unique water sports. 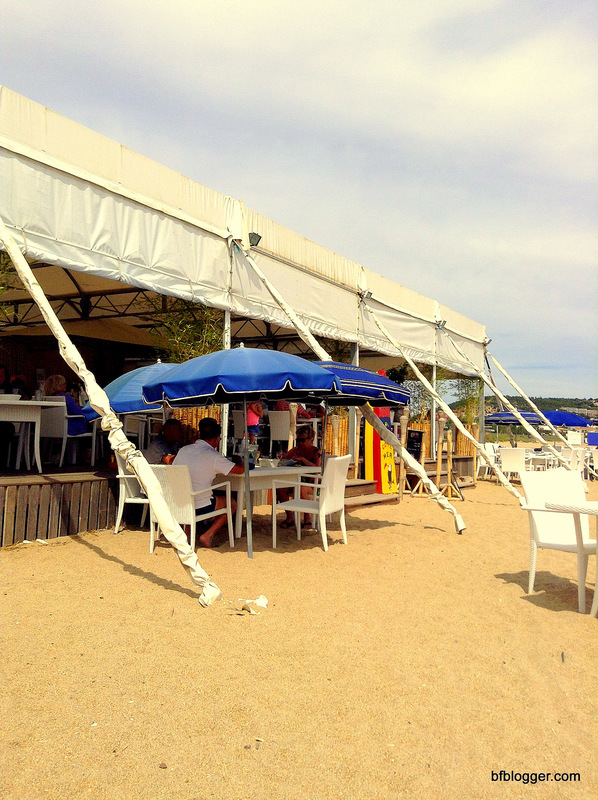 If you’re going to Sete in the summer and you want to go to a private club on the beach, MAKE A RESERVATION. We didn’t and ended up with one beach chair and one umbrella. As much as I love the French, there are a few things I just don’t get. The biggest thing is why business people don’t understand the concept of “turning over” tables, etc. For example. we went to a beach club without a reservation. We arrived at 11 o’clock in the morning and almost all the chairs were empty. Nevertheless, we were turned away because all seats were reserved. Even when we said we were only staying until 3pm and we’d be willing to move seats if people with the reservation arrived, we were denied our request. We left and went down the beach to another “club”. There the nice hostess found us one umbrella and one chair, even though others on her beach were empty. The four of us took turns sitting on the chair and on the sand. I figure the first establishment lost 40 euros business, plus our lunch trade. The second club could have seated us all, then taken in another 30 euros for chairs and umbrellas that were still empty when we left. Water jousting, or “joutes nautique” has been a summer sport and spectacle in Sete since 1666 when the seaport was formally opened. I thought I had missed the season since the biggest events are held earlier in August. Sea jousting is held throughout sea towns on the Mediterranean, though Sete is world famous for its teams and tournaments. To my surprise and delight, we literally ran into an event one afternoon where two teams from Sete were up against each other. You would never know that the home town team would win either way by the enthusiasm the crews on the jousting boats performed. They were both elegant and fierce. Each boat is filled with a team of ten oarsmen, one jouster and a “spare”, a helmsman and two musicians. The “spare” is onboard for the next joust. One jouster on each boat stands on a raised platform, called a “la tintaine” at the stern of the boat. He stands about 10 feet (three metres) above the surface of the water. After a polite “pass by” the jousters and crew are ready for the duel. It would seem the red team stacked the deck … so to speak. Even so, the blue team was victorious. Afterwards, it’s all about teamwork and getting quickly out of the boat to have a smoke and to celebrate. Is it any wonder I love Sete? Thanks, Nancy for being the “hostess with the mostest.” To readers who want to visit Sete, be sure to look up Nancy’s apartment on AIRBNB. She has amazing tours of Sete and the area, too. Also, thanks Christina Rabaste for welcoming me back to your studio and home to view your art. I’m looking for spaces to put them all! Love! Check out these earlier posts for more information about Sete, Nancy’s tours and Christina’s art. For more about water jousting, here’s the Men’s Journal’s view.